As we drift off for safety stop, school of jacks appeared obscurely! 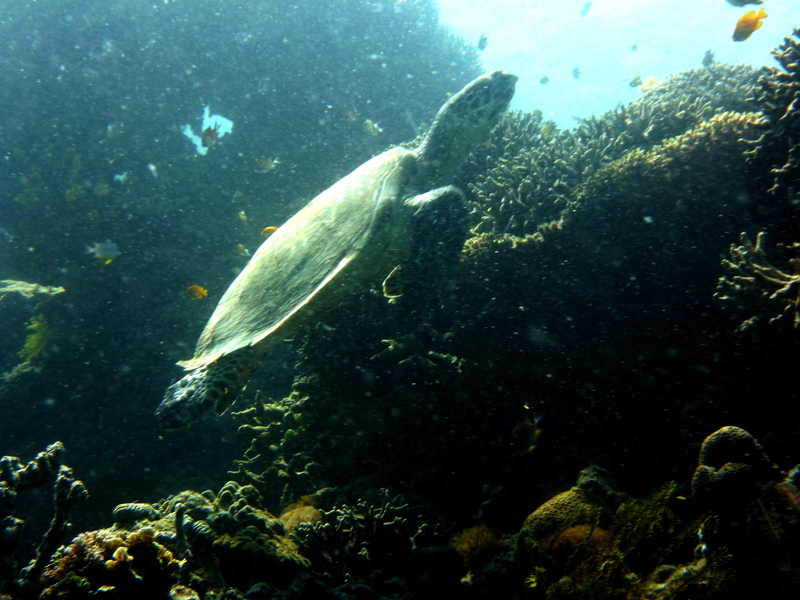 We were back again in Mantangale for CY 2015 dives kick-off, after two failed attempts in December and this January. 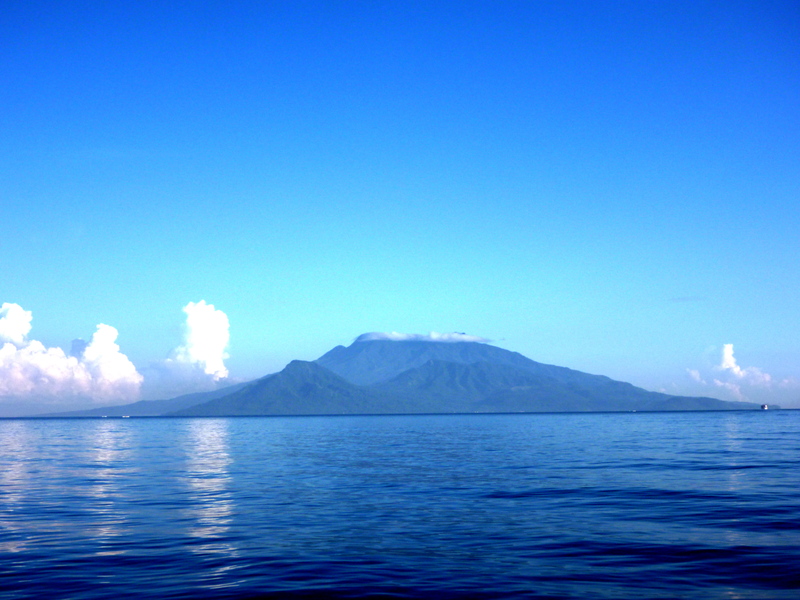 Aiming for Mantigue Island (in Camiguin), the desire was too great to ignore – my gills were dried up after nine long weeks from my last dive. 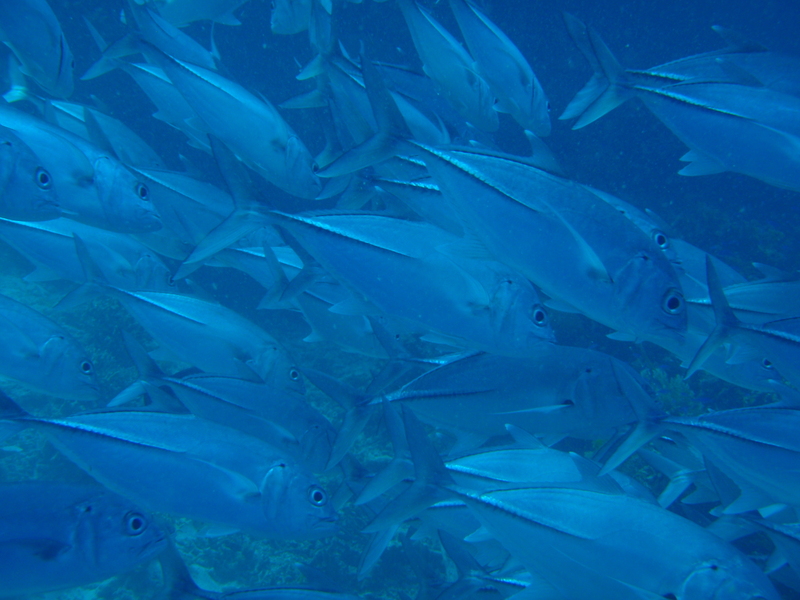 Early morning dive at Mantigue is preferable as waters can get choppy, my favorite school of jacks also appears on mornings as they look for food. We arrived late at the diveshop, but too grateful that the captain waited for us, it was a shame as other guests were already on the boat. We went deep for 48 minutes at 30 meters as deepest. Our surface interval include exploring the park with its mini- forest which Angel wanted, our cruise back to Talisayan and our lunch break of fish n chips! A drummer and a jack! Some guests call it a day and new tanks were needed for next dives, another boat came and after the transfers of equipment and passengers we prepared for the last descent. 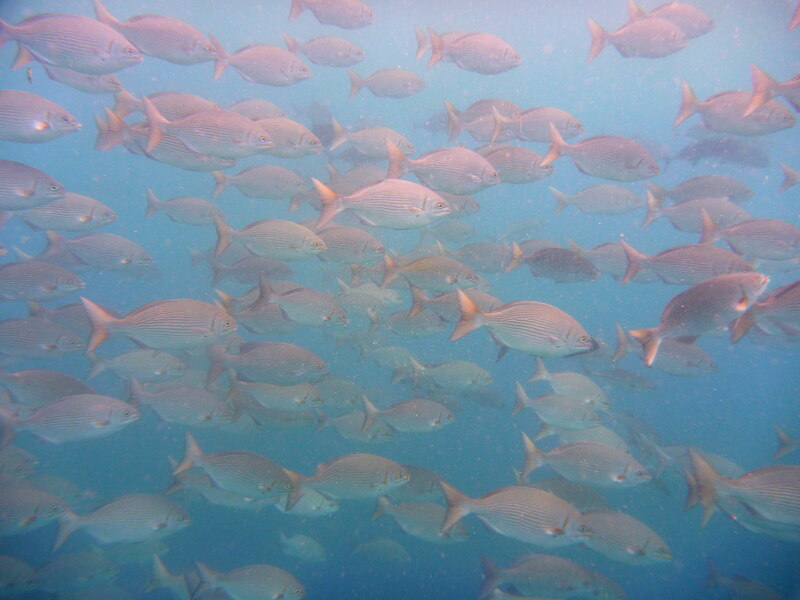 Sipaka, in the next town of Talisayan is another site with diverse marine life. We sighted stonefish, frogfish (! ), banded sea snake and giant groupers not to mention the colorful anthias and other tropical fishes hovering over the colorful reef. It was another relaxing viewing of the colorful depths, 54 minutes at 18 meters deepest. Both dives were at 30% EAN! If you are a diver and you haven’t been to Mantangale, you need to reconsider your dive trip plans. In my last engagement at MADRI, there were more than ten Russians for more than a week stay – either diving, swimming or lazing around in the beach. It was amazing they chose such obscure dive resort right here in Mindanao for their vacation, there must be something in this resort which I called my diving home. It was as a quick decision to have weekend dives in Mantigue Island and I was grateful for my mentor who is always there to cater to my requests, it was too easy for him as they opened an outlet in Camiguin Island. As my trips to the island were always with companions – with friends, family or even with work mates, this time I went alone for my much needed dives. The desire was just too great to ignore, I want to explore more and meet again remarkable creatures in the island’s depths. Arriving Balingoan port before 6am, there was a long queue already for the 2nd trip ferry – a scene like Holy Week when all people flock to the island. But it is still summer, so it’s not unusual that many people will cruise for the official summer destination in Northern Mindanao. My DM with instructions from my mentor was picking me up at Benoni port so there wasn’t much to arrange but be on board on the earliest ferry available. Decades ago, this island seemed so remote and in the late eighties DA people recoil from the mere mention of this place. We lost lives during a project visitation with no less than the head of the regional office, it was a traumatic incident not only for those who witnessed the tragedy but also for the whole Department. The story is now hidden in the past, just recently the island has been developed and now a nature park of LGU Mahinog – which is a commendable undertaking of the local government. Our first descent was a shore entry on the sanctuary going west, the shallows were covered with sea grasses until we went deeper on a sandy slope. 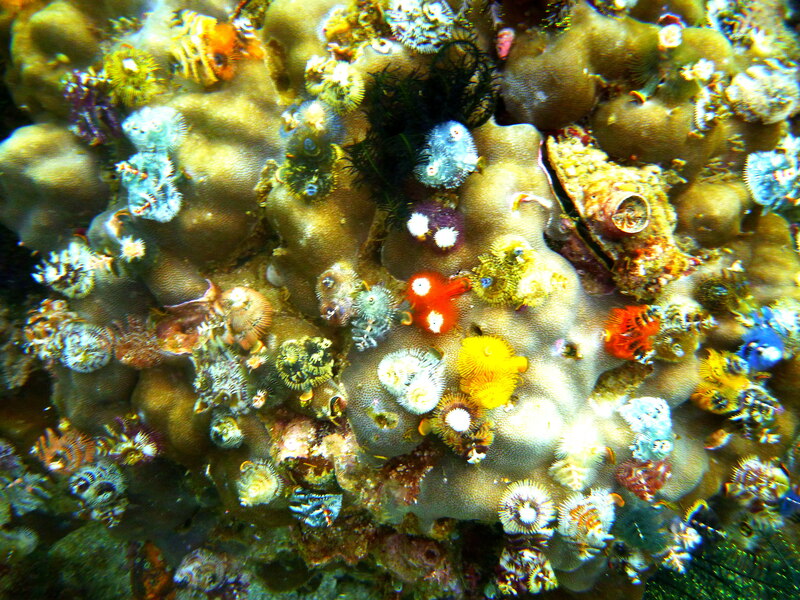 The reef was covered with soft and hard corals, invertebrates and had an active fish life. 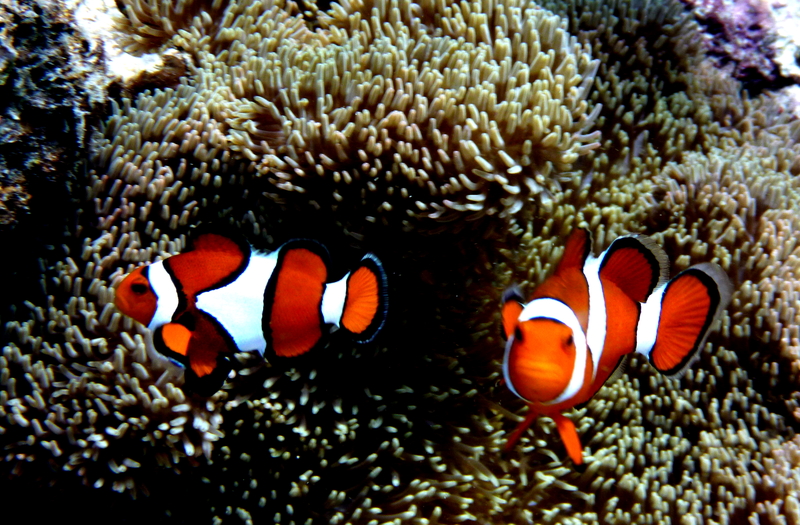 Big snappers, anthias, herd of oriental sweetlips, clown fishes, damsels, angels and Moorish idols. The big frogfish was a real big bonus! After 56 minutes we wade back into the shallows fro our interval, having 29.3 m as my deepest. 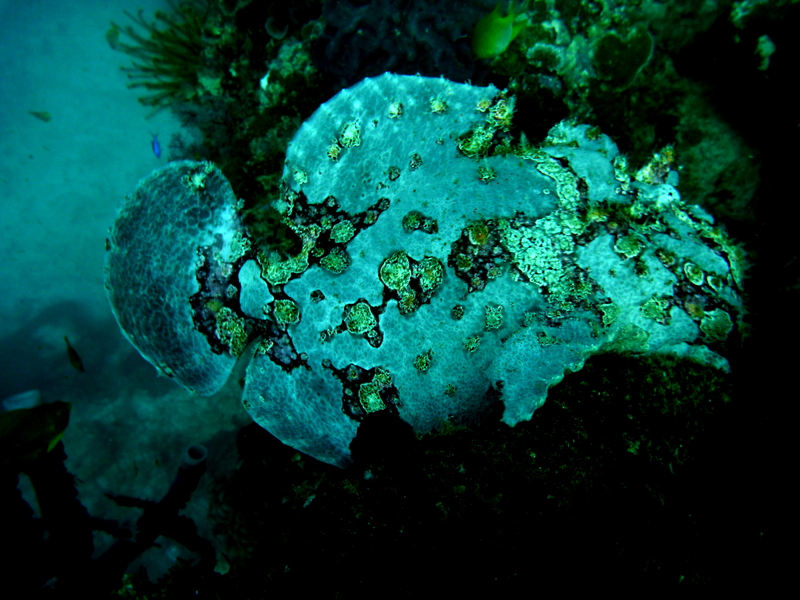 The large frogfish was a surprise! We wade back again for our next descent going east of the sanctuary, the site is indeed blessed with marine life – nemos, sea stars, anemones and corals even on the shallows. The reef was decorated with sea fans, crinoids, basket sponge, colored soft corals, sea cucumbers, variety of anemones, finger leather corals. 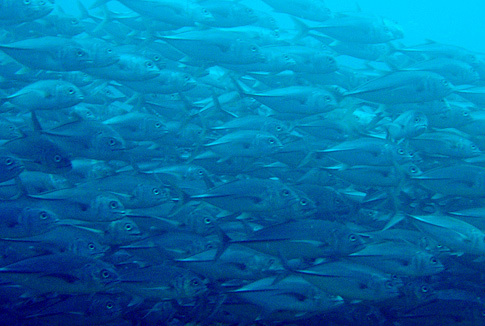 I was hoping to encounter again the large school of jacks, but only few was in view and quickly went away. My DM caught sight of a turtle, we tried to follow her but shy away. We swam back into the shallows after 67 minutes having 28m as my deepest. The lowly turtle is always a friend! My last descent for the day was in Black Forest, so the small boat brought us to the other side of the island, at past 2pm the waters started to be choppy. It was a sandy slope alternately decorated with hard and soft corals with variety of fish species around – boxfish, puffer, anthias, angels again, snappers, sand perch, goatfish. 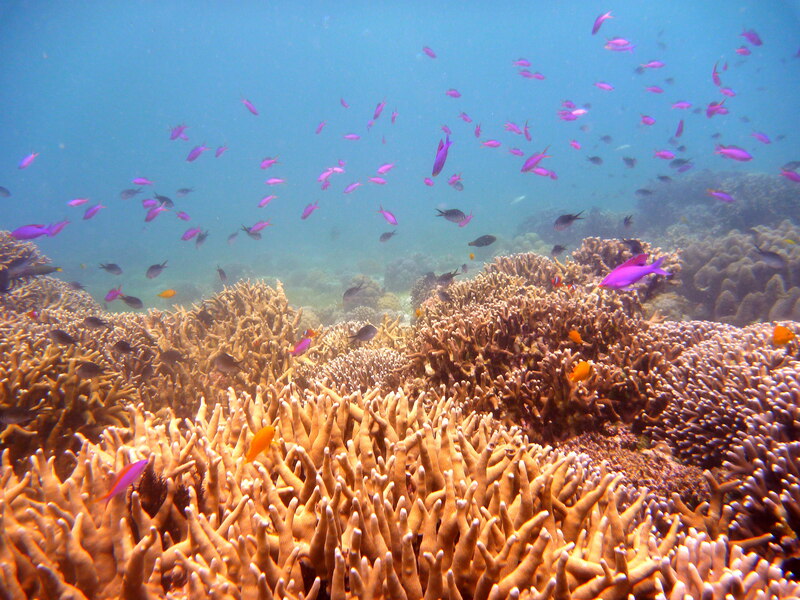 I lingered for few minutes on wide coral area with colored fishes hovering on top – lovely sight! My dive computer gave me flashing signals, I got erratic profile and have to maintain my depth for awhile. We swam until we got back to the sanctuary and ascend after 61 minutes having 26.2m as my deepest. One thing I love with this island is that it has still maintained its laid-back atmosphere and the locals are always friendly. It’s good to be alone as I got to discover new things, now I know that it’s not expensive to get around as tricycles can be your mode of transportation in going down town. 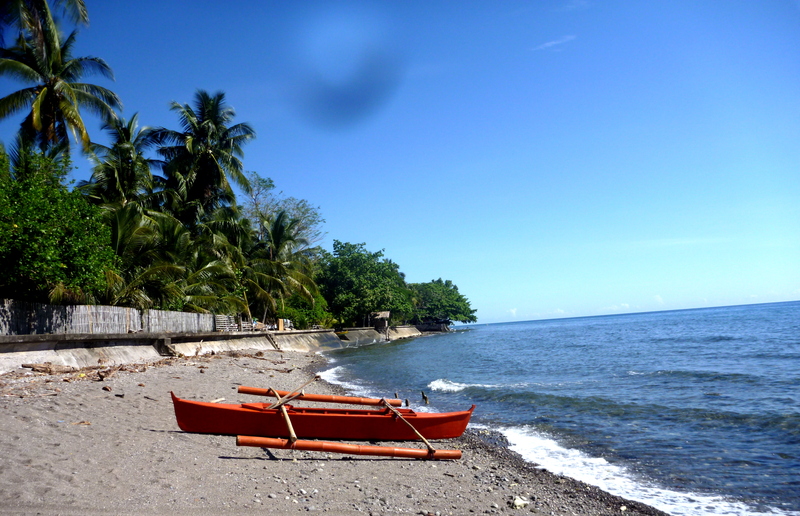 The next morning from the diveshop in Catohugan, Mahinog I went to Mambajao for two rides which only costs P 20.00. From the church after attending mass, I walked around to look for a Vjandep outlet (for the famous pastel) near the market. I walked again under the noon sun and asked around where to get a tricycle back, I was told to turn the next corner and the terminal was just under the big old acacia tree! Far cry from previous trips where I was with groups, we need to hire transportation which was some kind of expensive or if work-related, we would request from our local counterpart. That same old charm I love in Camiguin is still there, it’s one of those local destinations that never ceased to fascinate me. And now with easy access for my dive quest, I sure will be back again. There are more sights to discover in the depths! Interdependency among critters in the depths is not uncommon, this emperor shrimp was lurking under the belly of a sea cucumber, claiming as refuge. We turned the unsuspecting cucumber upside down while diving in Black Forest (Mantigue Island) to uncover the minute shrimp. Diving for almost five years now, there has been lot of meeting up with friends underwater – few astonishing, some endearing, others surprising or mystifying but most of them so wonderful. The thrill of seeing these wondrous creatures has always been overwhelming, putting them in words is not enough, surely won’t give justice to describe how marvelous it’s always been. Marine world completely blow me away, simply I fell in love with the underwater realm. 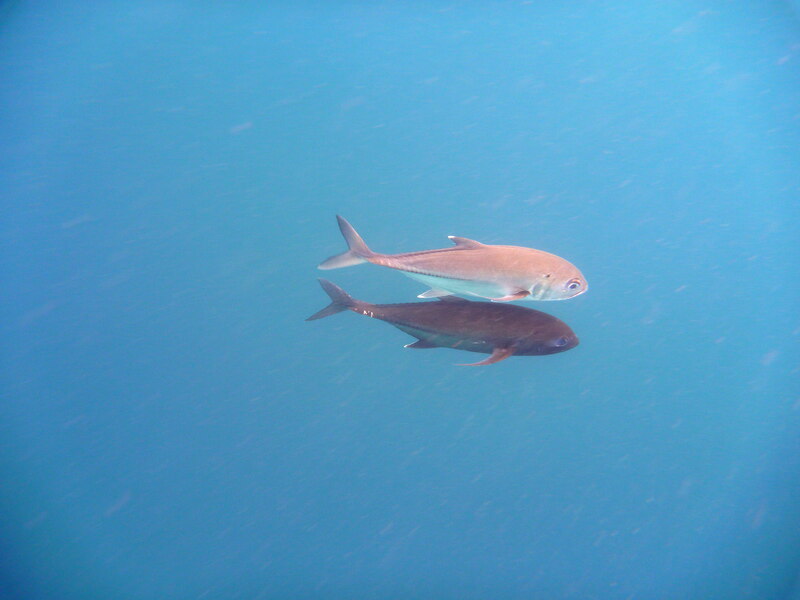 One of the species that I found magical and awe-inspiring is jack, a silvery fish belonging to the family of Barracudas, Tunas & Mackerels, Chubs, or Mullets. 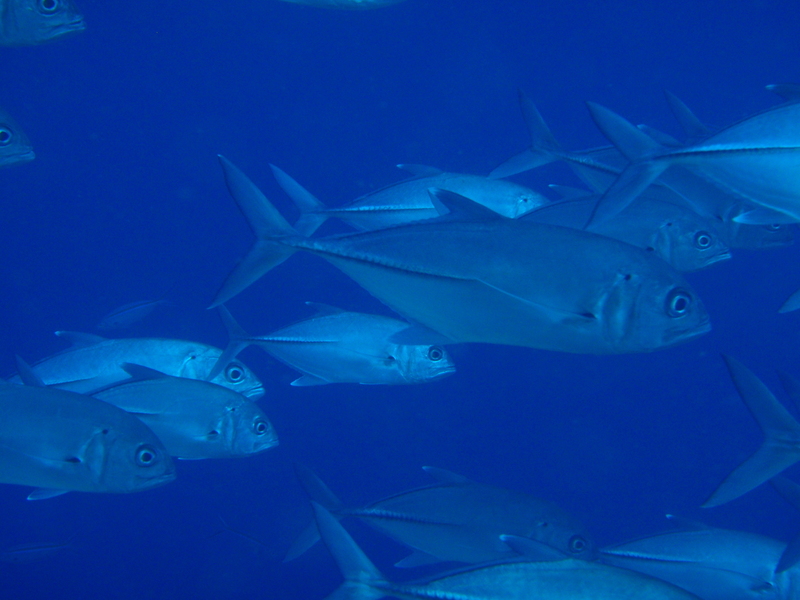 Locally known as Talakitok or Trakito, the larger version is better known as Trevally. As food fish, it’s superb and admittedly it’s one of my favorite. But I’m more interested of Jack out there in the wild, not on my dinner table. I better knew him in the deep, swimming coyly and gazing at me, at an arm’s length in his world. There are three remarkable spots so far where I had magical encounter with jacks – a large number of them or aptly described as in school. 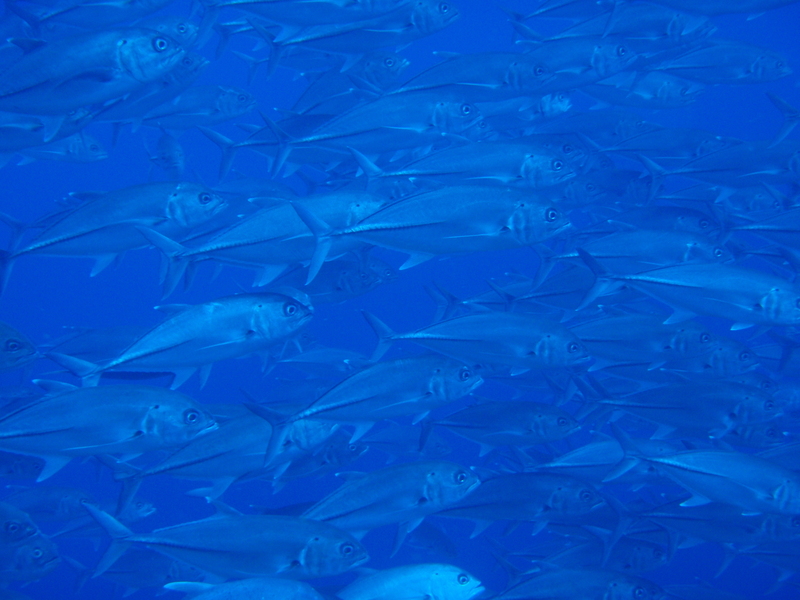 Apo Islandwith its great marine life and healthy ecosystem, was teeming with bigeye jacks in school. For sure, the local community’s effort in preserving and protecting the surrounding waters was not futile. 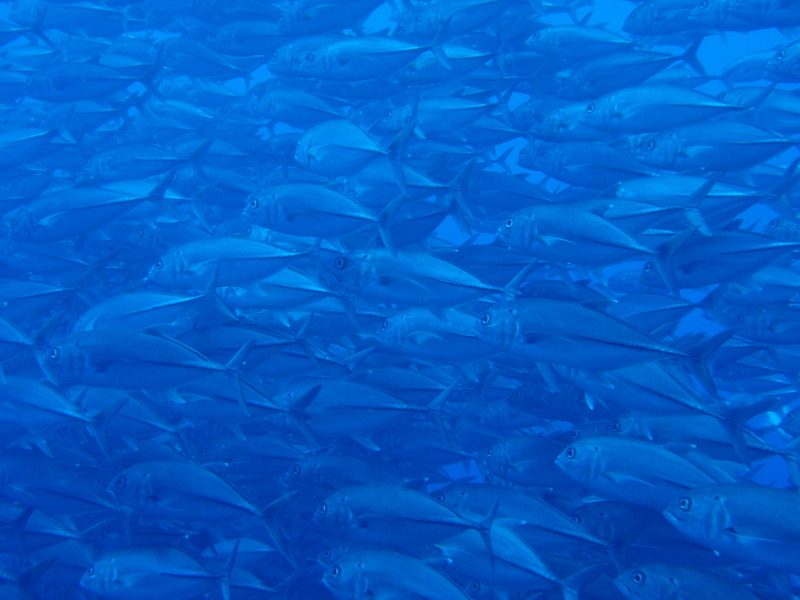 Lining up and swimming in unison in the blue before me – what a sight! Right in our very own Mantigue Island in Camiguin, when I first dove at the sanctuary I never expected an encounter with jacks, no one mentioned it to me. 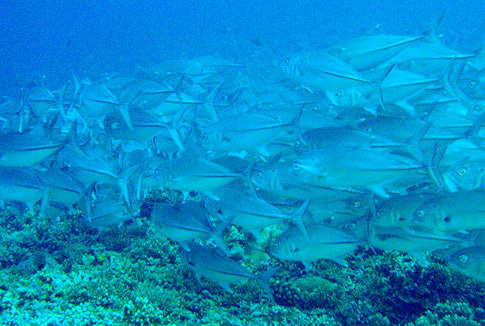 Awed, when silvery jacks appeared before me, again in unison swimming coyly, as if listening to the vibration of my own movements. There is some kind of magic that this humble Trakito can bring! Lastly, in the great Tubbataha Reefs, large school of jacks decorated a sandy slope after I got mesmerized with a whaleshark & reef sharks parade. They simply appeared like a wall, those huge glassy eyes staring at you. Even with current, they hung in mid-water with flawless grace. Their unity in going to one direction, or how easily they shift in opposite direction in accord is mind-boggling, as if someone is in command. The school moves with quiet order and control. There is a majesty and power in the movement of a unified mass, a kind of beauty and harmony that can only come from moving and thinking as one. 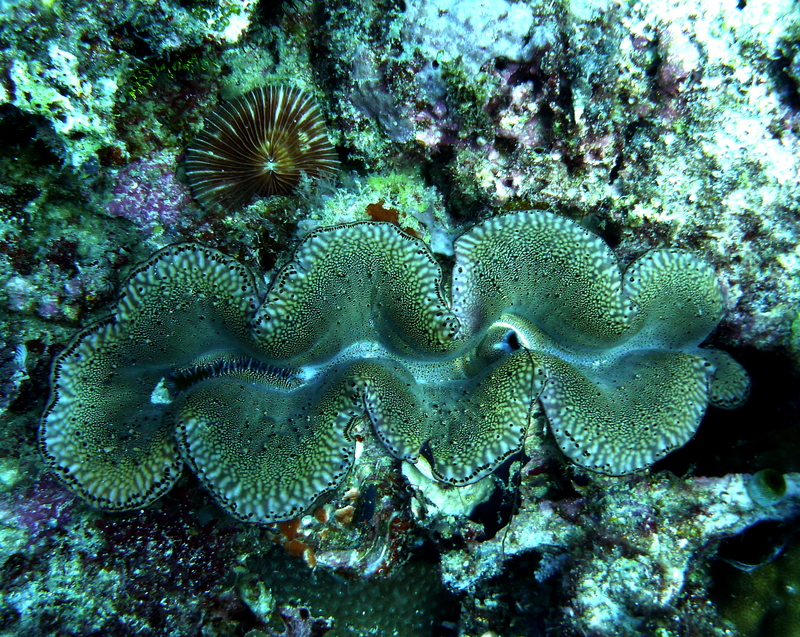 It is still a mystery to me, indeed how vast the marine life to unravel. My jacks in school is just one of its wonders!